- 5 % discount until 01 May 2018! 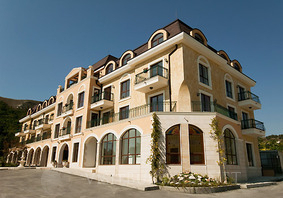 Location: Villa Allegra is a luxorious complex located just 50 m from the beach at Kavarna's sea area. The hotel is built in a typical Marine house style. Accommodation: Villa Allegra offers accommodation in one and two-bedroom apartments, equipped with kitchenette. One bedroom apartment: 2 regular beds and an extra bed, suitable for 2 children or third adult. Two bedroom apartment: 4 regular beds and an extra bed, suitable for 2 children or sixth adult. Hotel Facilities: Guests of the hotel can also use an open air swimming pool, outdoor barbecue, a small cafe and an underground parking lot.